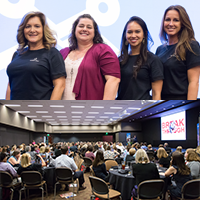 The 2018 Education Expo was a Record-Breaking Event! Education Expo SOLD OUT - for both Exhibitors and Attendees! It was wonderful to see everyone come together for the great education and networking at FSAEs Education Expo and Trade show. Thank you to our sponsors, exhibitors and attendees that made this event such a success! PMSI - Professional Marketing Services, Inc.